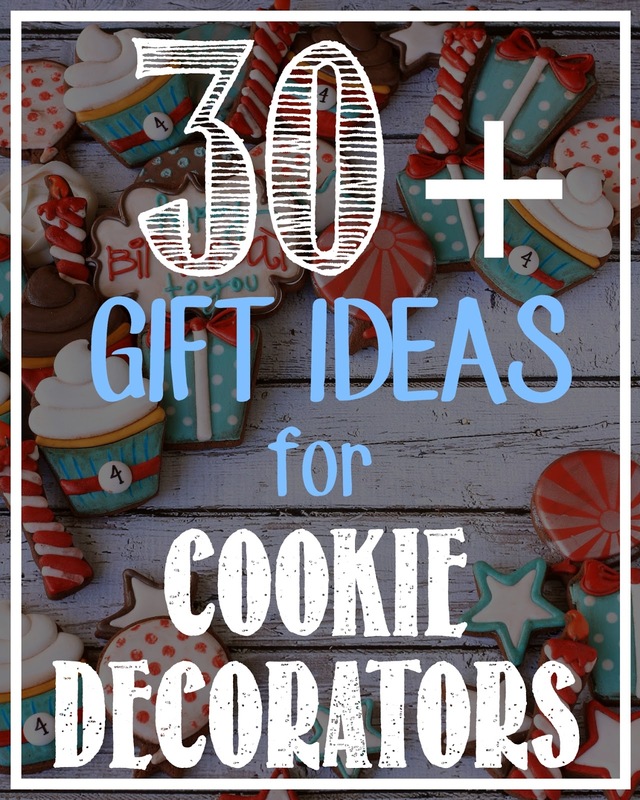 Don't know what to get your favorite cookie decorator? I've got you covered with this cookie decorating gift guide! If I know one thing about cookie decorators..it's that they fully support me in my quest to avoid laundry at all costs. But if I know a second thing...it's that they just NEVER. HAVE. ENOUGH. TIME. Maybe you've noticed this--you super-observant loved one. 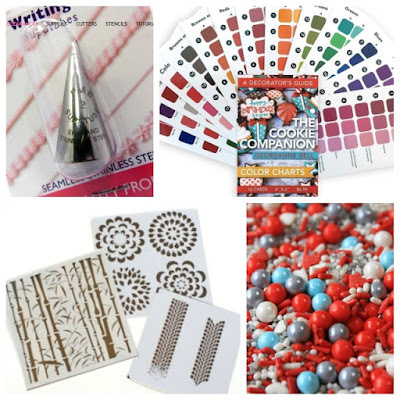 In an effort to save everyone a little time this year, I've put together a list of gift ideas for the cookie decorator in YOUR life. Or you know...for yourself, if you happen to be the cookie decorator in your life. If you are wondering where to start, I'm going to let you in on a little secret -- They want all the things. Stencils - HERE, HERE, HERE, HERE or HERE - Stencils are a quick and easy way to add patterns, words and designs to cookies. They can never have too many. Rainbow Dust Food Color Pens -These fine detail food color markers are always welcome! Black is by far the most popular. Tipless Piping Bags - Clean up is a breeze with these disposable piping bags! The Cookie Companion Color Chart Cards - Over 100 color formulas take the guesswork out of custom icing colors. Rake Brush - This fun brush makes wood grain cookies a snap! Sprinkle Mixes - Because they are fun. And beautiful. And sugar. Piping Bag Clips - These clips keep icing from spilling out the end of the tip while also keeping pressure on the icing inside the bag - reducing wrist strain from all that piping. PME Tips - These shiny gems of perfection are the gold standard of piping tips. The most popular sizes are #1.5 and #3. And no...they never really have enough. Offset Spatula - It's seems like a tiny thing, but this little spatula can spread icing, tap cookies, and move cookies without smudging icing. It's basically a rock star. Fun Measuring Spoons - There is a lot of monotony in the baking part of cookie decorating. Make it fun with bright colored spoons or measuring cups! Silicone Molds -- These fun little molds make quick work of fancy embellishments for cookies. Flowers, bows, and flourishes are generally a safe bet. Detail Brushes - These tiny brushes are perfect for the finest of details. PenBlade Knife -- My personal favorite is the #10 blade. The curved edges and surgical grade blade makes hand-cutting cookies so much easier!! Kitchen Aid Decals - Brighten up the work of mixing dough and icing with these fun decals! 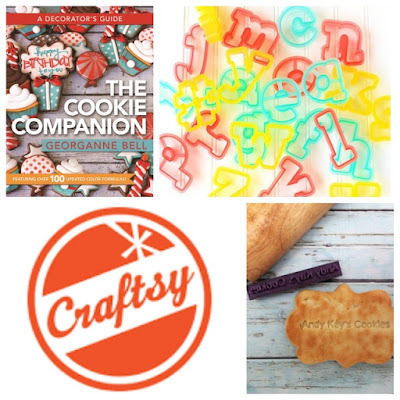 Craftsy Classes - If they can't make it to a live, in-person class...these classes are the next best thing! Buy them once and watch them whenever and wherever you want...as many times as you want! Heat Sealer - Just as it sounds, this device uses heat to seal cookies in an airtight bag. The 8 inch and 8 inch with cutter are the most popular sizes. Sweet Sugarbelle Alphabet Cutters - Because EVERYONE needs a good set of alphabet cutters! Baking Sheets - I promise you - they can use at least four more. Books - The Cookie Companion, The Complete Photo Guide to Cookie Decorating, Decorating Cookies. Cookie Stamper - Get a custom stamp made so that they can leave their mark on every cookie they make! Most people get one with their business name, but I'm kind of leaning toward one that says, "Help! I'm trapped in a cookie!" or "Not For Human Consumption." ...but that's just me. Stencil Storage - If they have stencils...they need a way to organize them! Get a binder if they don't already have one and grab a bunch of stencil pages too! Stencil Genie or Stencil Snap - Stencil frames hold the stencils in place over a cookie so a person doesn't need to have six hands to decorate. The Stencil Genie is like a lawn mower -- it gets the bulk of the work done quickly and efficiently. The Stencil Snap is like an edger - when you need more...nothing else works quite like it. Boon Grass Drying Rack - Fun and functional - this drying rack is for all the little decorating tools you don't want to lose. Also super awesome for drying stencils. Custom Logo Stamp - Get a self-inking stamp for all things paper, or get a regular stamp to use with special ink on cellophane cookie bags. Message the seller for custom logo stamps! Ott Lite Task Lamp - For a little extra light while working on the final details at night. Again. Food Photography Backdrops -- No cookie ever felt special when it's photo was taken on a baking sheet. Make your photos look professional with vinyl backdrops. Shipping is always more than you expect...so get a few of them to make it worth it! Glass Jars for Sprinkles - Because pretty sprinkles should live in pretty jars. Kitchen Scale - Weigh ingredients to streamline recipe prep and reduce time spent baking. Cookie Swivel - This cookie-size turntable allows you to decorate from any angle you want...without having to touch the cookie! Baker's Gonna Bake T-Shirt - Who can resist clothing made just for them?! Baking Jewelry - Try THIS or THIS baking charm necklace. Or this Baker's Gonna Bake bracelet or these Cookie Cutter Earrings. Disco Lowercase Metal Alphabet Cutters - One of my absolute favorite alphabet cutter sets! Display Stand - Elevate cookie presentation at markets and festivals with this iron basket display stand. 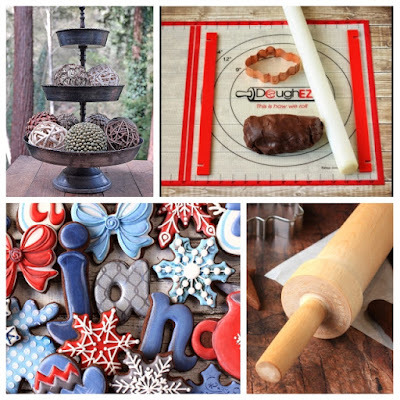 Cookie Countess Precision Rolling Pin - Solid birch rolling pin that comes with built in dough guides so cookies are never uneven or lopsided. Bun Pan Rack - Half Size or Full Size -- Save on counter space by stacking vertically. You can also purchase covers to go over the racks and protect drying or baked cookies. Dough EZ Mat - Avoid dough sticking by using this folding silicone mat. Included guide sticks also ensure uniform cookie thickness. 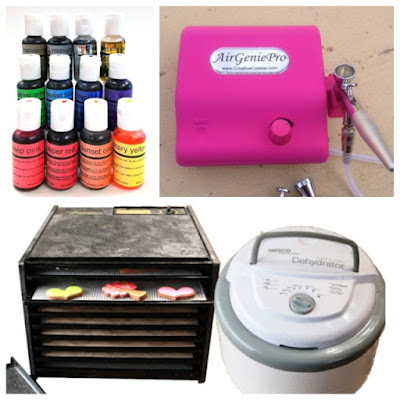 Basic Airbrush - Cake Boss - This is the best budget airbrush you can get. Solid performance at an affordable price. Subscription Box - Take the guess work out of gifting and get them a curated lifestyle box for cookie decorators. Premium Airbrushes - Cookie Countess - AirGenie Pro - Artfully Designed - you can also add a full set of airbrush colors from HERE. Pico projector and Tripod -Nobody's perfect...but most of us can trace perfection. This little projector projects images from a phone or USB drive down on to cookies for perfect piping, lettering, and designs every time. Dehydrator - Speed up the drying and decorating process with a dehydrator! As an added bonus, you can leave the cookies inside even when it's not on and you have your own cookie safe. Kitchen Aid Mixer - If the cookie decorator in your life does not have a kitchen aid mixer...they probably have awesome arm muscles. And are really tired from spending their entire life mixing. They would love you forever if you bought them a shiny new mixer of dreams. Vanilla - Ha ha ha ha....oh...I wish this weren't true. Vanilla is so expensive right now that getting a bottle of this in any size is truly at the top of many wish lists! McGoo U Subscription - A year's worth of online cookie decorating tutorials with Arty McGoo and hand picked instructors from all over the country...along with a generous helping of cookie comedy to reduce the stress of those late, late nights! Tell me - what would YOU add to the list? !